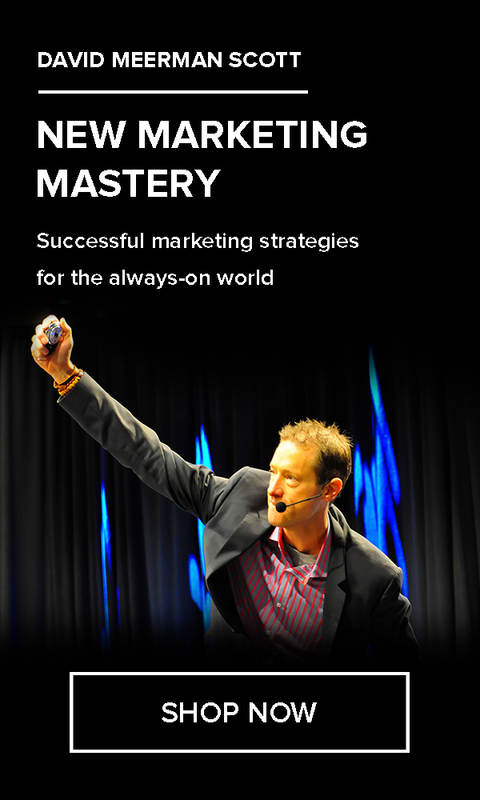 The following is a guest post from David Meerman Scott, an acclaimed marketing and sales strategist, and an honored speaker at Tony Robbins’ Business Mastery events. The frustration of relying exclusively on the media and expensive advertising to deliver your organization’s story is long gone. Yes, mainstream media are still important, but today smart marketers craft compelling information and tell the world directly via the web. The tremendous expense of relying on advertising to convince buyers to pay attention to your organization, ideas, products and services is yesterday’s headache. All people and organizations possess the power to elevate themselves on the web to a position of importance. In the new e-marketplace of ideas, organizations highlight their expertise in online media that focus on buyers’ needs. The web allows organizations to deliver the right information to buyers, right at the point when they are most receptive to the information. The tools at our disposal as marketers are web-based media to deliver our own thoughtful and informative content via websites, blogs, e-books, white papers, images, photos, audio content, video, and even things like product placement, games and virtual reality. We also have the ability to interact and participate in conversations that other people begin on social media sites like Twitter, blogs, chat rooms and forums. What links all of these techniques together is that organizations of all types behave like publishers, creating content that people are eager to consume. Organizations gain credibility and loyalty with buyers through content, and smart marketers now think and act like publishers in order to create and deliver content targeted directly at their audience. When people want to buy something, the web is almost always the first stop on their shopping trip. In any market category, potential customers head online to conduct research. The moment of truth is when they reach your site or social media feeds: Will you draw them into your sales process, or allow them to click away? While many marketers now understand that content drives action, and quite a few have embraced the ideas of content marketing, the vast majority focus their content effort only at the very top of the sales consideration process. In other words, they create content to attract buyers but none to support the salespeople. That’s a big mistake! People don’t go to the web looking for advertising; they are on a quest for content. When buyers arrive at your site or one of your social networking feeds, you have an opportunity to deliver targeted information at the precise moment when they are looking for what you have to offer. By providing information when they need it, you can begin a long and profitable relationship with them. Editors and publishers obsess over maintaining readership. So should you. To best leverage the power of content, you first need to help your site’s visitors find what they need. When someone arrives for the first time, he or she receives a series of messages—whether you realize it or not. These messages are answering the questions that matter to the visitor. Does this organization care about me? Does it focus on the problems I face? Does it share my perspective or push its own on me? Plumbers and other tradespeople used to generate business through the print telephone directory (when I was growing up we called it the Yellow Pages). I remember my parents both turned to it when they needed, say, a house painter or an electrician. We’re in a new world now. People go to search engines and consumer review sites like Yelp to research companies. In this new world, it’s not the expensive half-page Yellow Pages ad that grows business. It’s the best website—especially in a highly competitive market like plumbing. “Don’t let your money go down the drain! Call Big Birge Plumbing Company. For all your plumbing needs!” The clever, if punny, writing personalizes Big Birge Plumbing Company, making it stand out from the rest of the market. When the vast majority of plumbers either don’t have a site or just maintain a basic one with straightforward facts and contact info, being different gets you noticed. 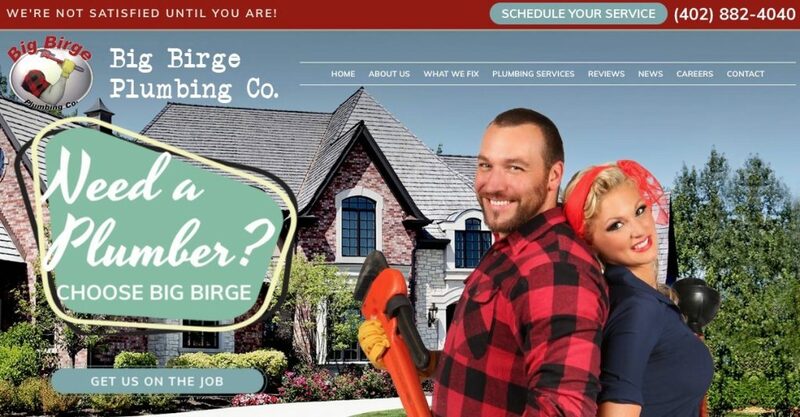 The Big Birge Plumbing Company site uses fun original photos, has a great design, and showcases the company’s humorous personality. The fun carries over to the design of their trucks (Lallenia with a “gasp” expression, peering into a toilet filled with money) and to their social media presence, including Facebook. In a crowded market—there are more than 400 plumbing companies in the Omaha area—Big Birge Plumbing Company has grown very quickly in less than five years in business. Big Birge Plumbing Company shows that anyone with a smartphone and a focus on reaching buyers online can grow a business, even in a very competitive market. When I checked recently, Big Birge Plumbing was ranked on the first page of the Google results for “Omaha Plumber.” That’s amazing, considering the company is only a few years old. You can achieve the same result in your market.